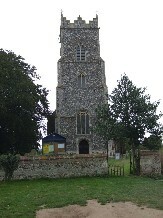 One of the most interesting small churches in south-east Norfolk stands above the wide open Halvergate marshes, where the Yare Valley prepares itself to reach the sea. We are still four miles from the coast here, but there is nothing beyond until you reach Yarmouth, except the haunting flatness. 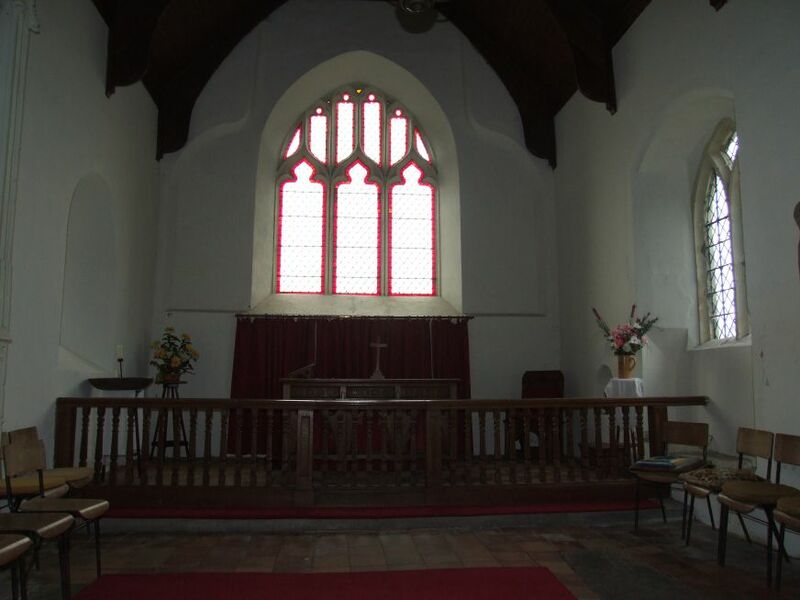 Half a millennium ago, this church itself stood on the edge of a wide, river inlet, but the silting up of the estuary has left its tower as a beacon for little more than river boats. Although there are signs of Norman origins, this church is different to many of its neighbours in that there was a lot of building happening in the 13th and 14th centuries. 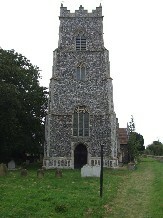 The tower is later, dated by bequests to the middle of the 15th century. 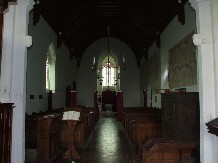 Rather a lot happened in the 19th century, too, for this is one of the churches restored by the Diocesan architect Richard Phipson. When Phipson is good (St Peter Mancroft in Norwich, St Mary le Tower in Ipswich) he is very good. 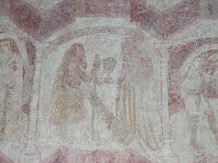 But sometimes his rural restorations reveal too much of his urban enthusiasms, and here, I think, the rustic feel has been smoothed away, which is a great pity, because St Andrew contains what are among the best 14th century wall paintings in England. 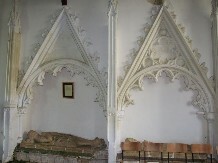 Many wallpaintings of this kind were lost when liturgical patterns changed in the 15th century, a full century before the Reformation, often destroyed by Perpendicular windows being punched through them. 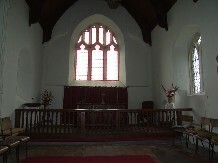 But the three main subjects at Wickhampton are pretty well complete. 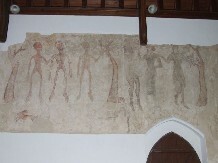 They are arrayed along the north wall, and that at the extreme west is the best surviving depiction in Norfolk of the Three Living and Three Dead. This contemplative illustration of an allegorical tale was particularly popular in the years after the Black Death. 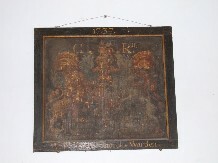 It depicts three nobles out hunting in all their finery, who meet three corpses in successive states of decay. As you are, so once were we, says one. As we are now, so you will be, says the second. Therefore, prepare to follow me, concludes the third. This barbed observation on the transitory state of wealth must have been more of a comfort to the poor parishioners saying their private devotions than to the lords and ladies in their chapels hearing private Masses. 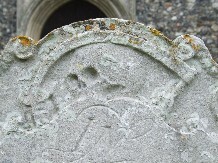 What makes the Wickhampton example so haunting are the little details; one of the nobles extends an arm with a falcon perched on it; meanwhile, a hare breaks cover below the corpses. 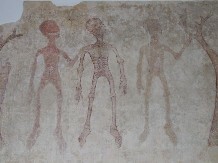 As my son pointed out, the corpses look a little like aliens from The X-Files. 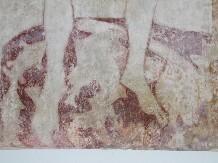 To the east of the Three Living and Three Dead is the more familiar subject of St Christopher. 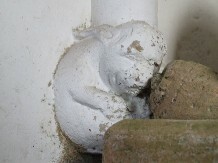 You will find him in many churches in south-east Norfolk; once, he must have been everywhere. There seems a little confusion as to the purpose of the St Christopher image. 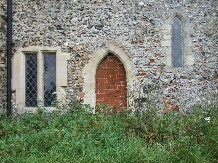 In guidebooks, it is often suggested that it was enough for medieval people to look at the image to prevent sudden death during the day's journey. This isn't quite right; medieval Christians didn't believe in magic, they believed in the Economy of Grace. They understood the dangers of dying without making a confession, and that they would be exposed to this danger more on a journey away from home than if they were in their own parish within reach of the Priest. 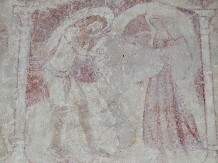 St Christopher was the patron Saint of travellers because his prayers would protect them on their way, but also because he would pray for their souls if they were taken suddenly from this life. 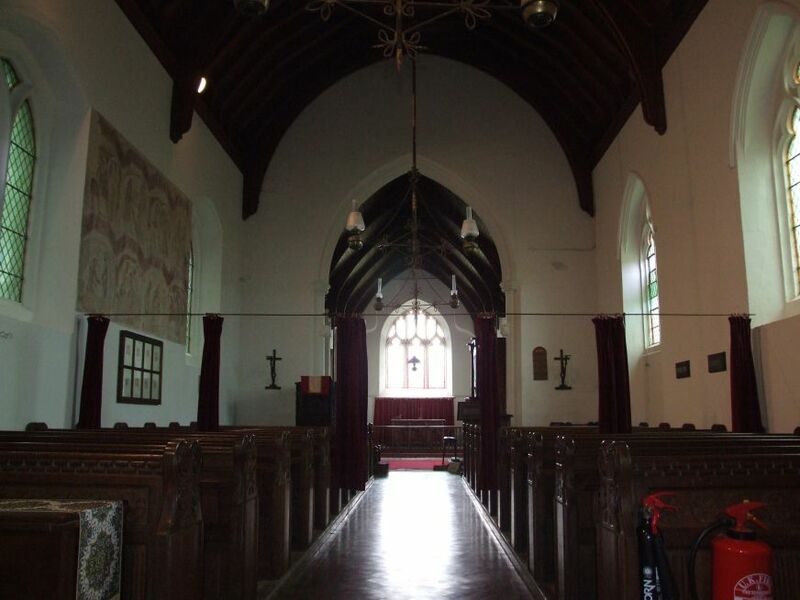 Every travelling stranger could focus their prayers to St Christopher by looking into the churches that they passed, because the image of St Christopher would be painted opposite the entrance. It made the church a kind of spiritual service station. 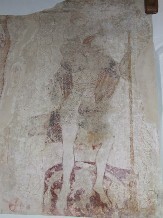 This St Christopher is a fine one, and although the upper part is indistinct, the water swirls dramatically around his feet. 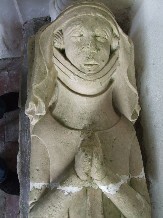 Wickhampton is not far from Moulton St Mary, and on the south wall there I had already seen a splendid depiction of the Seven Works of Mercy. There is another one here, and they are so similar that they must be by the same artist. This leads us to ponder if the artist was a local person, or if he was a travelling craftsman. I am inclined to the former idea, that someone in the parish with the skill had produced this under the direction of the Parish Priest. 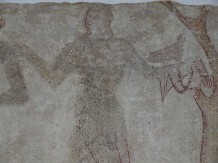 If so, then we are probably looking at 14th century Wickhamptonians; the illustrations are so vivid that we can see their dress, their hairstyles, even their facial expressions. 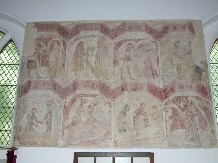 The Seven Works of Mercy were, and are, a Catholic catechetical tool, designed to help the faithful follow the teachings of Christ with regard to strangers as set forth in chapter 25 of St Matthew's Gospel. By meditating on these images, the worshippers could ensure they were carrying out this advice in their daily lives. The faithful are called upon to feed the hungry, to give water to the thirsty, to clothe the naked, to give shelter to the homeless, to visit the sick, to comfort the prisoner, and to bury the dead. 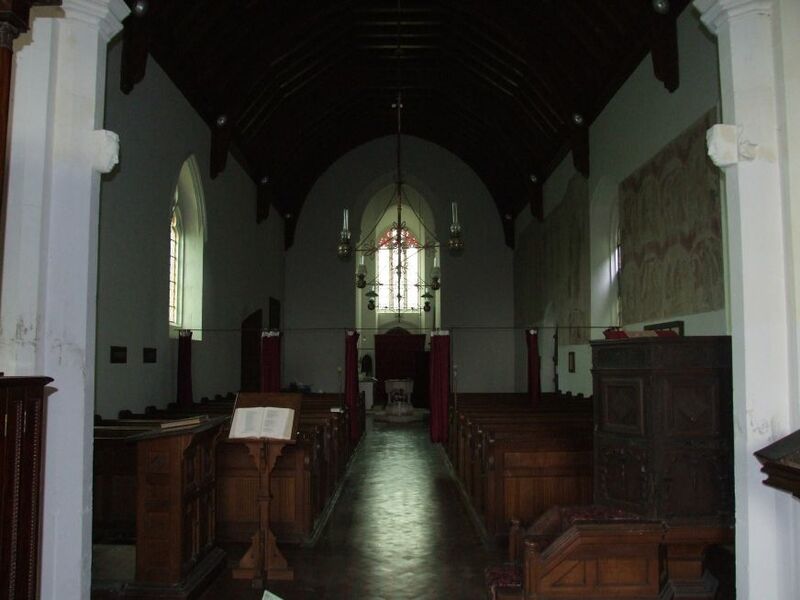 The way in which meditative images could be used to follow their example give us an insight into the way in which medieval Christianity was practiced in the days before congregational worship became the norm. The illustrations at Wickhampton are stunning in their simplicity and emotion. 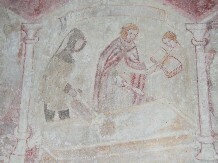 The Burying of the Dead panel in particular deserves to be as well known as any 14th century Christian image in the Victoria and Albert Museum, and yet here it is, in an isolated church on the edge of a wild Norfolk marshland. 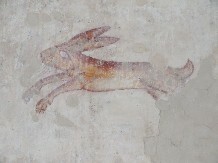 Most people will come to Wickhampton for the wall paintings, and certainly nobody with an interest in the 14th century should miss them. But they are not all there is to this church, of course. 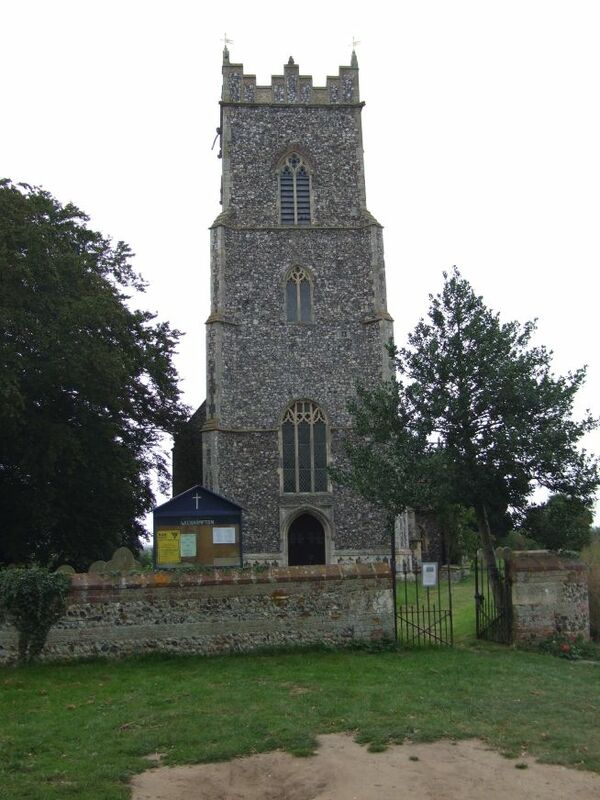 It is unusual, and refreshing, in this part of Norfolk, to come upon an Early English moment. 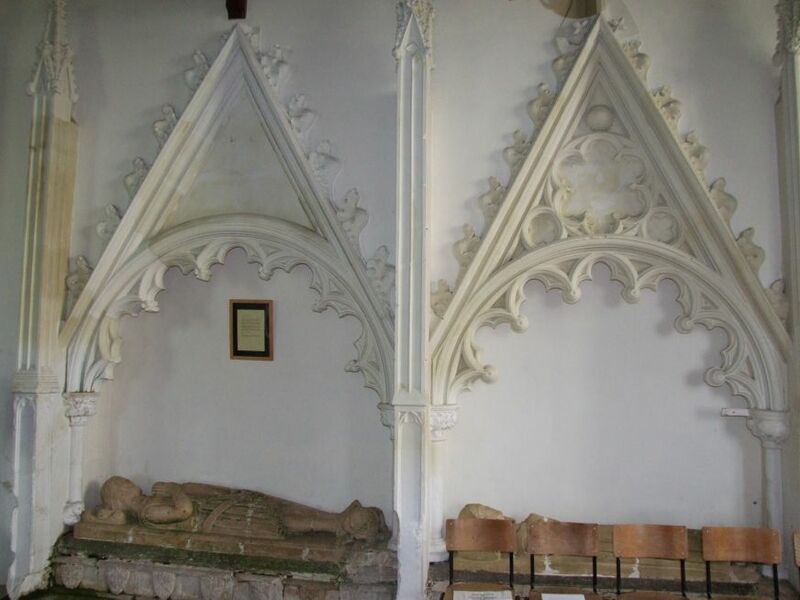 But that is what we have here in the form of the chancel, and in particular the two tomb recesses and their effigies on the north side of it. 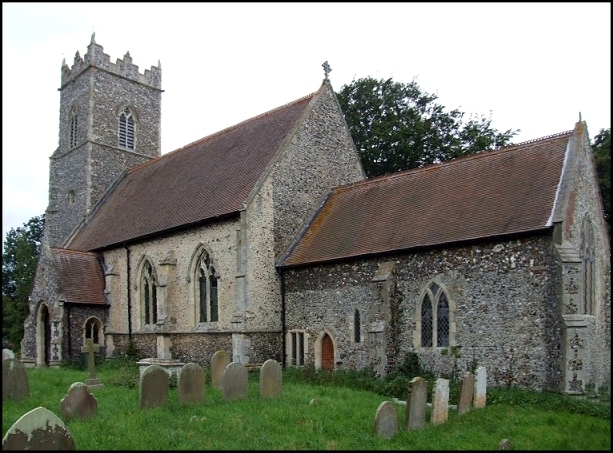 Pevsner eulogised their quality, pointing out that, although they date from before the Decorated period, they are already prefiguring its ornateness. 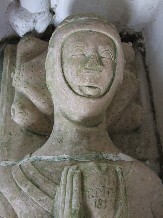 The effigies can be dated to about 1280, and depict Sir William and Lady Gerbygge. Some vandal has carved his initials and a later date on the heart that Sir William holds in his hands. His Lady wears a wimple, and their awed expressions are full of mystery. 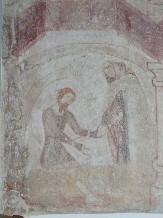 So often, we see familiar expressions in medieval portraits - the wall paintings here, for example - which reassure us that people back then were just the same as us now. Going further back, however, and crossing the divide of the Black Death, we find a world where the imagination is not so easily entered, and faces do not so easily give up their emotions, attitudes and intentions. What made Sir William and his contemporaries laugh? what lifted their hearts, and made them pause in wonder? We can never be sure. And yet, these people knew themselves to be East Anglians, just like me.